Summary of "Full Fathom Five Thy Father Lies". 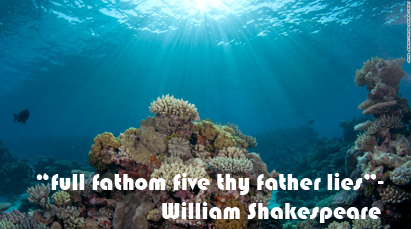 "Full Fathom Five Thy Father Lies" was written by William Shakespeare. 'Full Fathom Five Thy Father Lies' is an extract from William Shakespeare's play "The Tempest". William Shakespeare was a famous playwright and a poet of Elizabethan period. He was an active member of Theatre Company for at least 20 years. He continued to write plays at the rate of approximately ( लगभग ) two per year. He had written tragedies, comedies and historical plays. He wrote total of 154 sonnets. He offered his poetry as a means of immortality ( अमरता ) for both the youth and himself. His poems greatly dealt with the Renaissance ( पुनर्जागरण ) themes of friendship, love, death, change and immortality. This poem is an extract from William Shakespeare's play 'The Tempest'. This is a song sung by Ariel, the spirit to Ferdinand, the Prince of Naples, who mistakenly thinks his father is drowned ( डुबेको ) in a shipwreck ( ship accident ). Ariel tells Ferdinand that his father lies full thirty feet below in the sea. His death has become very meaningful here. His bones are changed into coral. His eyes have turned into pearls. No part of him has decayed ( नाशवान हुनु ). Rather, every part has changed into something valuable and strange. The sea nymphs living in the sea are ringing his death bell each hour. He says that he can hear the sound of the bell. Thus, the spirit tries to convince Ferdinand that his father's body hasn't decayed even after his death. He has transformed into something precious. This is also suggests that death is not the end of life. It is a change from mortal to immortal ( अमर ) life. The poem “Full Fathom Five Thy Father Lies” is a song sung by the Spirit Ariel in Shakespeare’s play “The Tempest”. The Spirit sings this song to Ferdinand, the prince of Naples, who mistakenly thinks that his father is drowned. The speaker of this poem is Ariel who is very powerful spirit of wind who flies lightly and invisibly playing music and singing songs. Here he sings the song about the death of Ferdinand’s father. According to him, Ferdinand’s father lies thirty feet below the surface of the sea. Ferdinand is very worried about the death of his father. Giving him sympathy Ariel says that his father has got quite meaningful death. His body is not decayed. Every part of his body has been changed into something beautiful, valuable and strange. His eyes are transformed into pearls and bones are changed into coral. The sea nymphs welcome his death by ringing the death bell “Ding-dong” every hour. In this poem, the spirit Ariel has presented very artful and melodious description about the death of Ferdinand’s father. The prince of Naples is worried thinking that his father is drowned. He is very sad about the meaningless death of his father. However, Ariel gives him sympathy by making the death meaningful through his powerful and magical description. He says that nothing of the dead body has decayed or rotten wastefully. Everything of the dead body is changed into meaningful and precious objects at the bottom of the sea. Ariel finally requests Ferdinand to listen to the death-bell rung by the sea nymphs to welcome his father’s beautiful and meaningful death. Ariel says that Ferdinand's father is dead and is lying thirty feet below in the sea bed. The Prince is very sad to miss his father in a sea-wind, so Ariel gives sympathy to him by saying that death is a meaningful change. He says that the bones of his father have turned into coral and eyes into pearls. Sea-nymphs respect him with death bell every hour. None of the parts have wasted but changed into more valuable. Ariel pretends that he is listening to the ding dong sound of the bell. In this poem death is shown as a meaningful change. Death is not an absolute end but only a process of transformation into another natural object. The main idea of this song is that - man who is part of nature transforms into another natural objects after death. The body of Ferdinand's father has been changed into something more valuable and strange. His bones have changed into corals and eyes into pearls. Even after death, he is warmly welcomed in heaven by nymphs by ringing the bell. Onomatopoeia : It is the imitation of natural sounds by words. For example, cackle, tin tin, buzz etc. In this poem, 'ding dong' is an example of onomatopoeia. It imitates the sound of the bell which is slow and lingering. Alliteration: It is the repetition of consonant sounds at the beginning of words or stressed syllables. In 'Full fathom five thy father lies', the repetition of /f/ sound gives it a musical quality. It also reminds us of the flow of the sea. Assonance: It is the repetition of the vowel sounds at the beginning of words or stressed syllables. It also enhances the singing quality. 0 Response to "Full Fathom Five Thy Father Lies | Summary In English"